This week on Reade and Write I welcome John Lindermuth, another prolific author who’s here to talk about his most recent novel, Something So Divine, as well as Shares the Darkness, the latest in his Sticks Hetrick mystery series. Welcome, John! Something So Divine is a historical mystery focused on murder, questions of morality and a bit of romance set in rural Pennsylvania in 1897. Ned Gebhardt is a feeble-minded young man accused of the murder of a girl he loves. His only defenders are a stepsister and a widowed shopkeeper. Influenced by the boy’s stepsister and, particularly, the widow with whom he’s falling in love, the detective puts his job and reputation in jeopardy to assure a fair trial for Ned. Anyone who is interested in an historically accurate story with emotional and psychological depth. I’ve lived a good part of my life in Pennsylvania and I’m familiar with rural communities in my area and their histories. The village in my story and the county seat across the river are fictional, but based on actual places. Research to me isn’t toil, but something I love. Newspapers from the period I’m writing about are among my best sources for information to make my stories accurate. Every novel has its issues. Once I got in the flow and familiar with my characters, this one came together rather quickly. Since writers usually have little choice in such matters, I’d have to leave it up to Hollywood and hope they’d select the right actors. To date, I’ve published 14 novels and a non-fiction regional history. My novels include six in my Sticks Hetrick mystery series. The seventh is due out in September. I discuss writing with several other local writers on a regular basis. We read one another, but there’s nothing formal about the relationship. I believe it’s important to do so. I don’t set a word count. Even if it’s no more than a paragraph or two, it keeps you in the right frame of mind. I read both fiction and non-fiction and I’m constantly discovering new and inspiring writers. When it comes to mysteries, some of my favorites include James Lee Burke, Ruth Rendell, Elmore Leonard, Harlan Coben, Charles Willeford, Elizabeth George and Mark Billingham to name a few. In general fiction some favorites include Jim Harrison, E. L. Doctorow, Arturo Perez-Reverte, Bernard Cornwell, Charles Portis and a host of others. Health permitting, another trip to Mexico. If we could step back in time, I’d like to have seen Africa as it was in the early 20th century. Read a lot and write a lot. There’s no better instruction. Though it has its silly moments, I’d have to say ‘The Gods Must Be Crazy.’ A low budget classic, it has so much to say about human nature, psychology and the interaction between nature and human nature. It became a box office success with little promotion, other than word of mouth. Jamie Uys was a genius. Trust your instincts and follow your dreams. Unfortunately, it took me some time to learn those lessons. Is there anything I haven’t asked that you wanted me to? Jan Kepler and Swatara Creek Police Officer Flora Vastine were neighbors and schoolmates, but never close. When Jan, a school teacher, avid birder and niece of a fellow officer, goes missing and is found dead in a nearby tract of woods Flora finds herself thrust into the middle of an examination of the other woman’s life in search of clues. As usual, the police have more than one crime to deal with. There’s illegal timbering and a series of vehicle thefts taking up their time. And there are other issues to deal with. Flora is concerned there’s some shakiness in her relationship with Cpl. Harry Minnich who seems to be making a lot of secretive phone calls. observes the cost of obsessive love and tracks down the killer. Amazon, Barnes & Noble and anywhere good books are found. Thanks for being here, John! P.S. Still having problems with these bullet points! This entry was posted in Interview and tagged John Lindermuth, JR Lindermuth, Shares the Darkness, Something So Divine, Sticks Hetrick mystery series. My goodness. All these comments while I was at work today. Very good interview, John and Amy. Popular blog spot, Amy. I’ve come to like historical novels. Not all, but this one does look good. Thanks, John and Amy. I enjoy learning from my fellow writers and am inspired to write a historical novel, probably from the WWII era. As for movies, mine is Double Indemnity. I haven’t seen The Gods Must Be Crazy but it’s going on my TBS list. The WW2 era is popular with readers. Go for it. Thanks for commenting. Double Indemnity is high on my list of favored films. This interview, and the comments after, kept me entertained and educated. John – you are an erudite fellow. Your books sound fascinating; I look forward to starting with Something So Divine. Your cover shown here is intriguing and well-done. Who’s your cover artist? You keep good company with the authors you read. Elizabeth George’s books in her series are incredible. Your favorite movie tells us a lot about you. Therefore, great interview, Amy! Isn’t it great to read the comments following a blog post? You can learn even more than what was in the interview. I’m glad you enjoyed meeting John, Pam. I am also looking forward to starting with Something So Divine. Thanks for dropping by! Kelly Martin did the cover. I hadn’t worked with her before, but love the results. Thanks for commenting. I’ve read “Something so Divine” and thought it was a wonderful story! 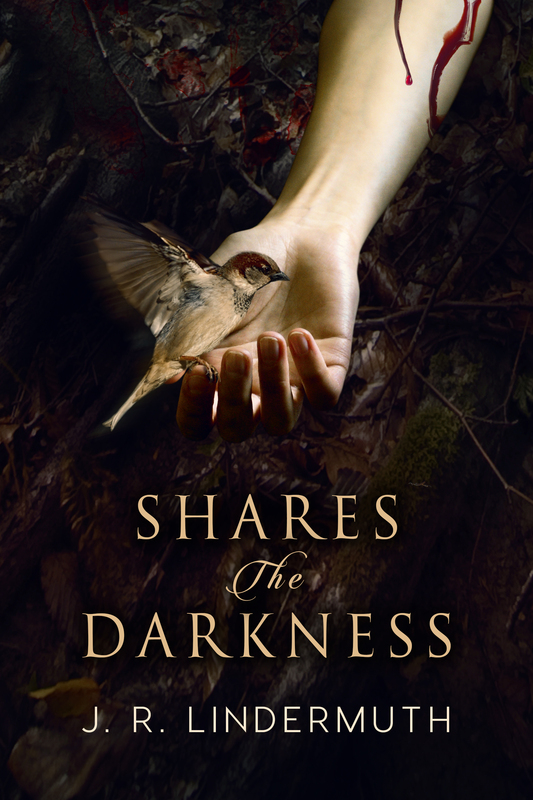 Can’t wait to read “Shares the Darkness”. Great interview, and thank you for sharing. Like you, I enjoy research. Unfortunately, for the book I’m working on now, I keep running into brick walls. There just isn’t much on the era I’m interested in for the area I’m using in the story. I’ll figure it out. Hang in there, Marja. I’m sure you’ll think of something, even if it’s to fictionalize the setting a bit more and put an Author’s Note about it in the book. Glad you enjoyed the interview with John. Thanks for commenting, Marja. I hope you enjoy Shares The Darkness as much as you did Something So Divine. Very nice! I like when a book focuses not only on the Murder but on additional crimes as well! It sounds like John had his work cut out for him keeping story threads straight! I’m looking forward to reading his books. Thanks for stopping by! Yes this was a good read. Yes I actually read Something So Divine and did enjoy this read. I’m glad you enjoyed it, Jerrilynn! Thanks for sharing your comment! Good interview. John. I’m reading Something So Divine now and enjoying it very much. It’s an excellent piece of work. Glad you enjoyed the interview, Earl! Thanks for dropping in. Thanks for hosting me today, Amy. Appreciate it. You’re most welcome, John. My pleasure! Great interview! For those of you who haven’t read “Something So Divine,” I highly recommend it. It’s a fantastic novel! Great comment, Pat! I need to read it. Glad you stopped by today. The God’s Must be Crazy? Interesting choice…mine would be Stand by Me (if I’m feeling nostalgic) or The First Wive’s Club (If I need to laugh out loud). Mine would have to be Mr. Blandings Builds his Dream House, with Cary Grant and his perfect comedic timing. Thanks for dropping in, Judy!